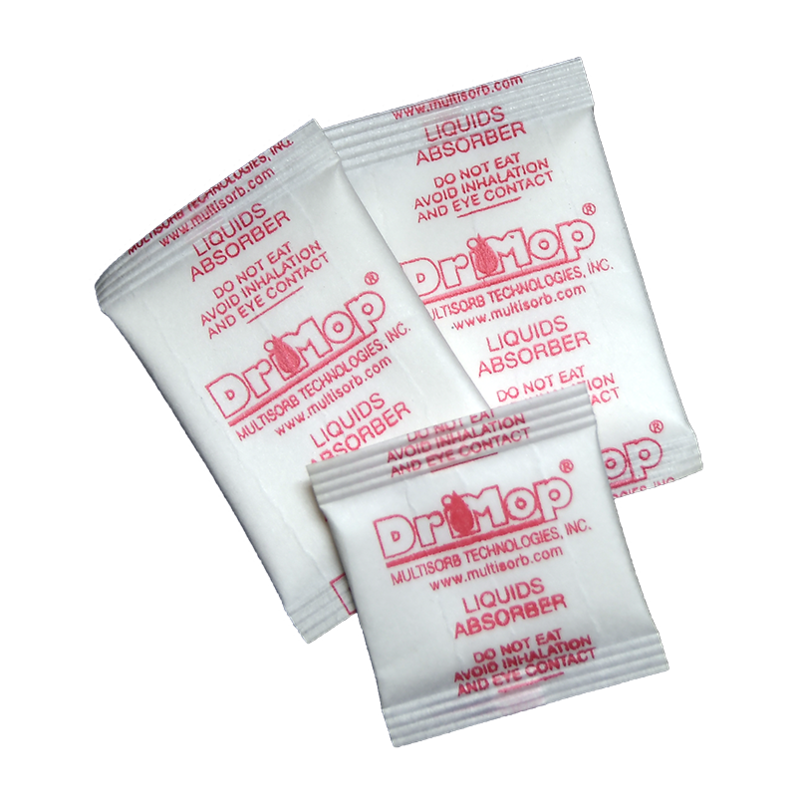 Super absorbent DriMop Liquid Absorber packets quickly absorb up to 400 times their own weight in aqueous solutions. Available in self-bursting pouches and laminated sheets (LINK: DriMop Liquid Solidifying Laminate Paper), these drop-in liquid absorbers offer the ideal solution for shipping, storing, and handling of aqueous solutions that must be contained quickly and effectively in the event of a leak. DriMop’s specially formulated pouch bursts open in the presence of a wide range of fluids to quickly immobilize them. Solidified material is easily contained by an outer vessel, shipping container, or other such device, resulting in safer handling. DriMop pouches are also available in strip form for use in automated dispensing systems. Standard sizes are: 0.5 gram, 1.5 gram, and 5.0 gram. Customized sizes can be produced for specific needs. The most common applications for the use of DriMop liquid absorbers include medical shipping containers and bio-specimen transportation bags used for vials, test kits, and lab trays. DriMop Liquid Solidifying Laminate Paper is a fiber-based paper bonded with DriMop Immobilizing Powder. This versatile application delivers the same fluid control protection as the DriMop Packets in areas where space is a premium. DriMop Laminate Paper provides effective fluid control in almost any size or shape container.